The spinal cord is surrounded by a bony structure made up of vertebral bodies. They protect the extremely sensitive spinal cord from injury. They run from the head down to the tail tip and can be divided into cervical (neck), thoracic (chest), lumbar (mid-body) and sacral (tail) vertebra. The different vertebra all have different structures, but fulfil the same role. Between every vertebral body is an intervertebral disc that provides flexibility of the back as well as absorb shock when moving and jumping around. The intervertebral disc is composed of a soft gel centre that gives it its flexibility, and a harder fibrous outer layer, surrounding the gel centre. When the fibrous layer starts to degenerate, the gel centre follows the path of least resistance and starts to push upwards onto the spinal cord that runs directly above it. This is a disease mainly seen in dogs, and cats are very seldom affected. Factors that increase the risk are breed or genetic predisposition, excessive weight and weak muscle development. Breeds with short legs and long backs like the Dachshund, Pekingese, Shih Tzu and Corgis are often affected. These breeds are also referred to as chondrodystrophic breeds. This term describes the condition in which the cartilage develops abnormally and tends to degenerate at an earlier age compared to other breeds. It is important to note though that disc disease is not exclusive to these breeds and can occur in many other dog breeds as well. There are two types of ‘slipped discs’, called Hansen type I, and Hansen type II. Hansen type I is the more serious one where the disc tears or ruptures and where the disc material almost “explodes” (also referred to as prolapse or herniate) up into the spinal cord, causing severe damage and subsequent paralysis. This typically happens in middle aged to older breeds mentioned above. This prolapse can happen at any point in time, and it may or may not be related to an event like a fall or a jump. As an owner of such a dog you may think that the dog was perfectly normal up to the point of the incident, but in most cases there would have already been damage or degeneration which may have started a long time ago. With Hansen type II, the onset is much slower, and the disc material only pushes up or protrudes and press onto the spinal cord -partially. This causes a variety of clinical signs ranging from low grade pain to instability in the hind quarters called ataxia or muscular weakness also known as paresis. Disc disease in non chondrodystrophic dog breeds is often a result of a specific event where the dog injures themselves by falling or jumping. A normal healthy disc only tears with severe abnormal force applied to it and is very uncommon. In most cases in other breeds where there is disc disease it is as a result of aging and or degeneration of the cartilage which make up the disc material. The spinal cord consists of nerve tissue that conveys impulses to and from the body to the brain. It is extremely sensitive tissue that does not regenerate well after it has been damaged. When damaged, it heals by scar tissue formation and depending on the level of damage rarely regains its function. The damage done to the spinal cord when a disc pushes onto it are both due to mechanical compression, as well as secondary inflammatory changes to the nerve tissue. When the disc material presses onto the spinal cord, the pressure on the spinal nerves causes pain and it disrupts nerve impulses traveling to and from the body. The clinical signs will differ depending on where the compression happens. The disc material can prolapse anywhere from the neck down to the lumbar area. Due to the relative rigidity of the spine in the chest area and the extra support and protection provided by the ribs, disc prolapse will rarely happen in the chest area and is more likely to happen in the neck and at the lower body area. One area which is particularly vulnerable is the area behind the last rib where the chest and mid body or lumbar spine meets. If a disc herniates in the neck, before the front limb nerves, both the front and the back limbs will be affected. If the protrusion happens in the area between the front and back limbs, only back limbs will be affected and front limbs will be normal. Signs usually seen are pain, weakness and instability of the back legs with the body swaying from side to side when the animal walks. In severe cases the animal may lose the ability to walk altogether and become paralysed. Dogs in pain will often yelp when picked up or moved and they may walk with an arched back and tucked in abdomen. If the neck is involved, the animal will walk with a stiff lowered neck, unwilling to move it from side to side or up and down. Ataxia can be seen as uncoordinated movements of the limbs. The back limbs will frequently cross over and affected dogs will not know where they are placing their limbs in space. In severe cases affected animals cannot use their back legs at all and might drag them along completely. A provisional diagnosis can be made by looking at the breed and age of the dog, the presenting clinical signs, and by doing a thorough clinical exam, which will include a neurological exam. The clinical signs will provide some clues to the vet of the type of disc disease. To make a definite diagnosis, further diagnostic imaging will be required, with an X-ray being the first step. Unfortunately an X-ray cannot show up the actual degree of protrusion of the disc due to the fact X-rays do not show soft tissue as well as bone. It does however show a narrowing in the disc space between vertebrae compared to normal healthy discs. 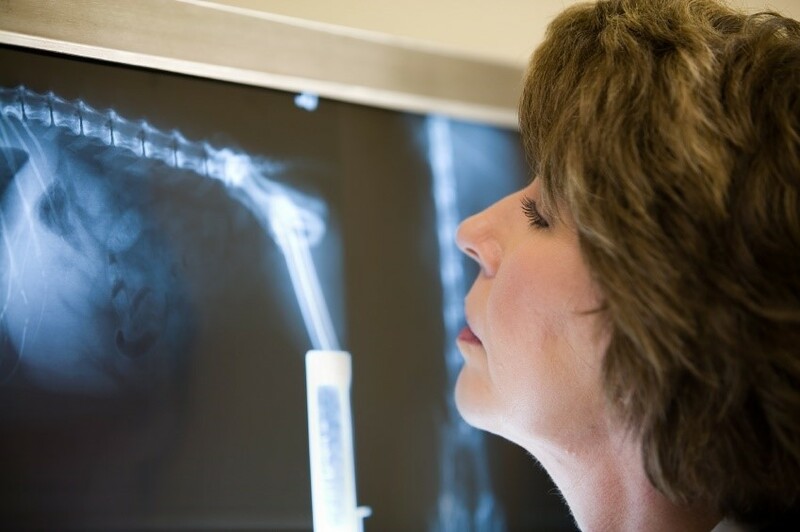 X-rays are a necessary and useful step in the diagnostic process as it rules out other potential cause of back problems like spinal cord tumors and fractures. After an X-ray is done, a myelogram should follow. With this procedure a dye is injected into the space surrounding the spinal cord. If there is a compression of the spinal cord, it will show up clearly on the X-rays taken afterwards. An MRI or a CT scan can be done in place of a myelogram, but these procedures are often more expensive. The reason for doing a myelogram or an MRI is not just to make a definite diagnoses of a disc herniation, but also to localise the area where the disc is herniating and assess the degree. If surgery is a possibility, the exact location of the herniated disc is of utmost importance. It is important to get your pet to the vet as soon as possible if you suspect it to have a disc problem or if you see any of the symptoms described above. Keep it as quiet as possible in the meantime. There are two ways to deal with a dog presenting with disc disease, and the decision will depend on the presenting clinical signs. It can either be treated medically or surgically. In both instances the aim is to get the pressure off the spinal cord to prevent damage. It is important to realise that medical management is only reserved for patients showing very mild signs for the first time and this will be decided after a full clinical exam neurological evaluation and diagnostic procedures have been done. Medical treatment comprises of strict cage rest and anti-inflammatory medication to reduce swelling of the spinal cord. Probably more than 50% of cases presenting with disc disease require surgical treatment. A dog presenting with complete paralysis and with decreased sensation in the hind limbs needs to be treated as an emergency. There are different surgical techniques used, all of them taking pressure off the spinal cord to prevent further damage. Recovery can sometimes take long and adequate nursing care and physiotherapy is needed. The earlier the compression is fixed, the easier recovery will be after surgery. Prognosis after surgery depends on how severe the spinal cord has been damaged, and for how long. With rapid intervention and proper after care, prognosis is good. Unfortunately surgery cannot prevent another disc from herniating at a different location and 33% of dogs can have another slipped disc after surgery. Prevention includes regular exercise and a good diet, keeping dogs fit and slim. In dogs that are prone to disc disease, jumping on and off furniture must be restricted to a minimum. The importance of getting your dog to the vet if you suspect that it may have disc disease cannot be overemphasised. Sometimes even waiting and hour or two may mean the difference between life and death for your pet. If damage to the spinal cord has progressed to the point where your animal cannot feel deep pain when their toes are pinched, it is usually too late, even for surgery.